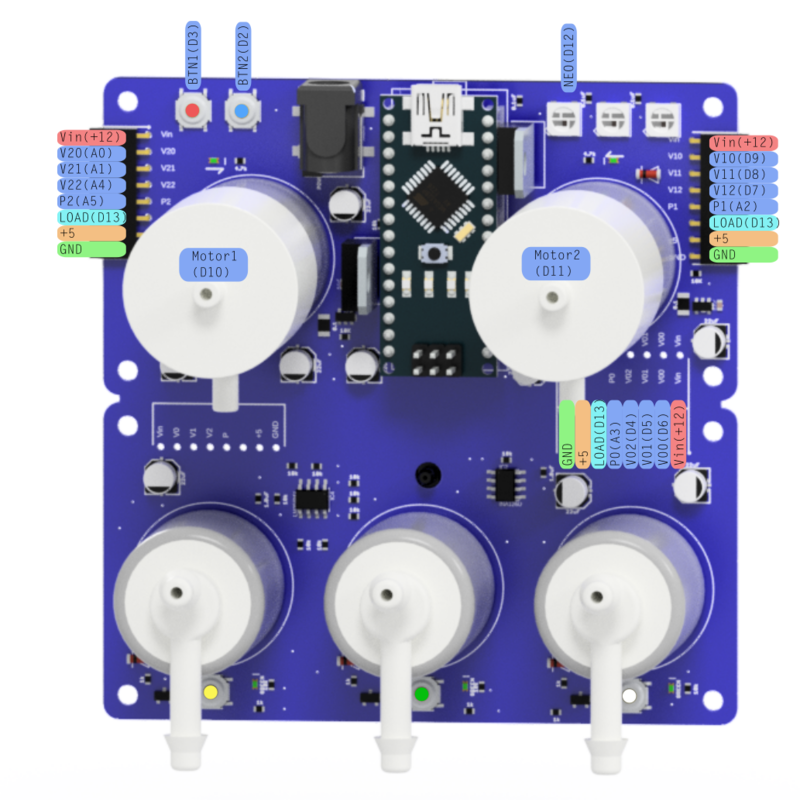 Want to be notified of new releases in Programmable-Air/PCB? D13 - Drives the base of the Load transistor. The collector of the Load is broken out as Load. You can connect it to an external pump or relay for regulating them. D4 - Drives Valve #02 via a transistor(on the valve board). Can be used as a GPIO if slave board is not connected. D5 - Drives Valve #01 via a transistor(on the valve board). Can be used as a GPIO if slave board is not connected. D6 - Drives Valve #00 via a transistor(on the valve board). Can be used as a GPIO if slave board is not connected. D9 - Drives Valve #12 via a transistor(on the valve board). Can be used as a GPIO if slave board is not connected. D8 - Drives Valve #11 via a transistor(on the valve board). Can be used as a GPIO if slave board is not connected. D7 - Drives Valve #10 via a transistor(on the valve board). Can be used as a GPIO if slave board is not connected. A4 - Drives Valve #22 via a transistor(on the valve board). Can be used as a GPIO if slave board is not connected. A1 - Drives Valve #21 via a transistor(on the valve board). Can be used as a GPIO if slave board is not connected. A0 - Drives Valve #20 via a transistor(on the valve board). Can be used as a GPIO if slave board is not connected. The yellow, green and white button are connected to the base of the transistors driving their respective valves and override the signal from the Arduino. They are intended to be used for testing a new soft robot without any coding.